If you’ve ever had a toothache before, you would know just how painful it can be. Small as the affected area is, toothaches can be so painful that you won’t be able go about much of your daily routine. And, more likely than not, that toothache was caused by tooth decay. Dehydration is a well-known side effect of drinking, which is why you feel so parched the morning after a night out drinking. And, among the laundry list of things alcohol is bad for, it also happens to include your teeth. By decreasing the flow of saliva in your mouth, drinking alcohol allows bacteria to cling to the tooth’s enamel. Drink it often enough and you could find yourself dealing with tooth problems, among many other things. Apart from causing dehydration, alcohol also has a relatively high sugar content, which is notorious for causing tooth decay. If you ever need any more reason to convince yourself or anyone close to you to stop smoking, tell them that it’s bad for their pearly whites. Although being around them frequently when they smoke could be just as bad for your teeth. This is because both smokers and those exposed regularly to second-hand smoke have been shown to be at an increased risk of cavities. 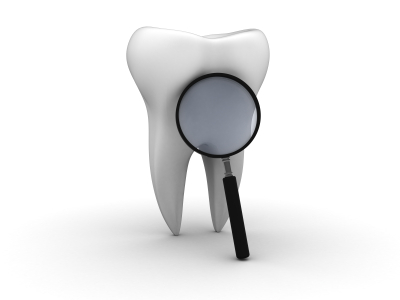 Specifically, poor oral hygiene is one of the main causes of tooth decay and other oral problems. Dentists recommend that you should at least brush your teeth twice a day, and floss at least once. In fact, if possible, you brush your teeth after each meal. Although this isn’t exactly practical for everyone. Fail to brush and floss your teeth regularly, and the bacteria in your mouth flourishes, and produces even more lactic acids than ever before. If left unchecked, the bacteria’s acid can damage the enamel of your teeth, which will eventually lead to tooth decay. However, if you brush regularly, you can prevent the bacteria from building up around your teeth, which reduces your risk of tooth decay. Eating sugary snacks and drinks regularly isn’t just bad for your weight, it’s also bad for your teeth too. As it turns out, the bacteria on your teeth enjoy the sugary treats just as much as you do, turning it into lactic acid in as little time as twenty minutes. The same goes for starch as well. If you haven’t paid your dentist a visit in quite some time, now would be the best time to do so. Avoiding the dentist is just as bad for your teeth as any of the four culprits listed above, if not worse. Remember, visiting the dentist often helps make sure that you’re always on top of your teeth’s needs, whether it’s a simple cleaning procedure, or to check for any signs of tooth decay, and generally, the prevention of tooth decay and other oral problems. Make an appointment today for a check up and cleaning with Tyngsboro Cosmetic Dentist, Dr. James Yankowskas at 978-649-7773. www.tyngsborocosmeticdentist.com. Do you have a broken or chipped tooth that’s making you feel conscious about your smile? Well, worry no more! Your dentist can easily fix these small imperfections and much more using dental bonding. Dental bonding is an in-office procedure where dentists use and apply a tooth-colored resin material to the teeth to repair small imperfections. The dentist molds the material directly onto the tooth and uses adhesives and then a high intensity curing light to harden the resin and turn it into a durable extension of your damaged teeth. The cosmetic procedure typically lasts only for a few minutes but may take longer depending on the complexity and size of the problem area. Although the procedure very rarely, if at all, takes more than one visit to complete. The treatment starts by removing some of the surface enamel so the dentist can shape the composite resin properly to your tooth. Then, the dentist applies a bonding agent before adding the composite resin. The dentist then uses a special light to cure the composite resin to make sure that it’s properly bonded to your teeth. The dentist then finishes things off by polishing your teeth, which helps make the bonded tooth look better and more natural. To ensure the best quality of service, make sure that you work with a dentist who actually specializes in cosmetic dentistry and has had extensive experience regarding the procedure. Bonding is for most people, but not exactly for everyone. Case in point, dental bonding is a very effective procedure for repairing small chips and cracks, as well as misshapen and discolored teeth. 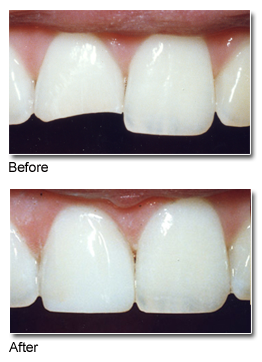 Bonding can also be used to help improve the length, width or shape and small overlaps or gaps in your smile. However, bonding is primarily only for those who want to improve the appearance of otherwise healthy teeth. This means that bonding can’t help treat or fix more extensive problems, such as crooked teeth that are the result of an over or under bite. The best thing about dental bonding is that it is durable and can last for as long as 10 years without requiring any visits to the dentist for upkeep and maintenance. However, this is only possible if you take proper care of your teeth. In particular, after dental bonding, you’ll want to avoid eating or chewing anything hard, such as hard candy and ice cubes. Remember, as durable as they are, the bonding material is not nearly as strong as your natural enamel, and chewing on anything hard, especially on a regular basis, can and will crack the material. Speaking of cracks, do talk to your dentist about getting a night guard if you grind your teeth when you sleep. Say goodbye to cracked, chipped and discolored teeth! Dental bonding is a great and affordable option if you’re interested in improving the way you look when you smile. However, don’t forget to take care of your teeth and gums first so your natural smile is as healthy as it is on the inside as it is beautiful on the outside. Call today for an appointment to fix your broken or chipped tooth at 978-649-7773. Visit the website to learn more about the practice at www.tyngsborocosmeticdentist.com.